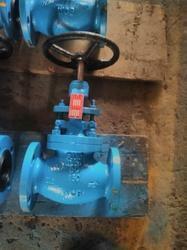 Our product range includes a wide range of cast steel globe valve. We are engaged in manufacturing superior Bellow Sealed Valves which are offered in various patterns like straight patterns, oblique patterns, angle patterns and needle designs. It comes with large variety of internal seat construction variants. Theses globe valves are useful for flow control or on/off isolation of fluids and these are manufactured from the superior quality of the raw material. Advanced machinery is used in the production of globe valves which consists of cutting machine, drilling machine. Size Range : 1" to 30"